Every year Interbrand compiles data to release the top 100 lost of the best brands in the world, regardless of the industry they belong to. Started in 1974, Interbrand made each brands presence known by creating and managing them as valuable business assets. Offering the world with one of the largest brand consultancy with over 40 offices worldwide. Today, the consultancy firm released the list of Top 100 brands in 2010. 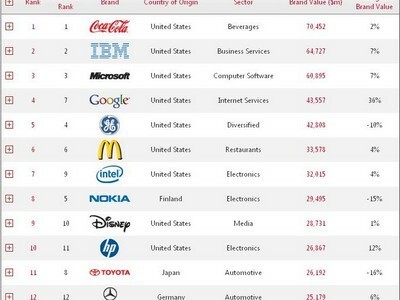 Coca Cola, IBM and Microsoft were able to retain their position for the ‘Top 100 brands of the world’ list which was made public by the consultancy firm. Coca Cola grabbed the pole position with brand value worth more than $70 Billion while IBM stood at the second with $64 Billion and Microsoft on the third having a brand value of $60 Billion. The leaders were followed by firms including, Google and General Electric. Google made a remarkable recovery as the brand value rose from about 36%. Last year the brand value stood at a figure of $31 Billion with this year till the filing of the report the brand value rose and came to $44 Billion. This year was the year for Android, where Google witnessed great sales in smartphones and activating almost 200,000 sets everyday. Certain other factors did contribute to make the brand strong and increase the brand value. The biggest achiever on the list was ‘Apple’ which witnessed a trend of almost 37% making the brand jump from 20th place to 17th. Some might not consider this as a very big change but to climb even a single place on the list is pretty hard. In 2010 Apple had a brand value of $21 Billion compared previously to $15 Billion in 2009. Great sales of Apple gadgets were witnessed this year with some of the best contributed by iPad. Another tech firm, Intel, was seen with a climb with now standing at the 7th position compared to 9th, previously. A 4% change was witnessed in the brand value with the brand surely making a change. The biggest loser on the screen was Harley Davidson declining by 24% and now standing at 98th place compare to 73 on the previous one.